This misting fan will cover an area up to 1200 square feet, will last around 5 hours on a full tank of water, and weighs less than 100 pounds when the tank is empty! Great item to keep that outdoor party or barbeque cool on the hot summer days! It can drop the ambient temperature up to 20 degrees! This item requires a standard 110v power supply. SKU: DAA01. Categories: Party & Event, Miscellaneous Party, Heaters/Fans. 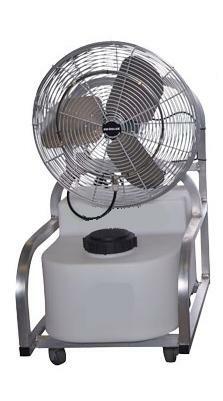 Tags: air chiller, fan, mister, misting fan.